The United Nations Open-Ended Working Group (OEWG) on Nuclear Disarmament completed its second and most substantive session in Geneva earlier this month. 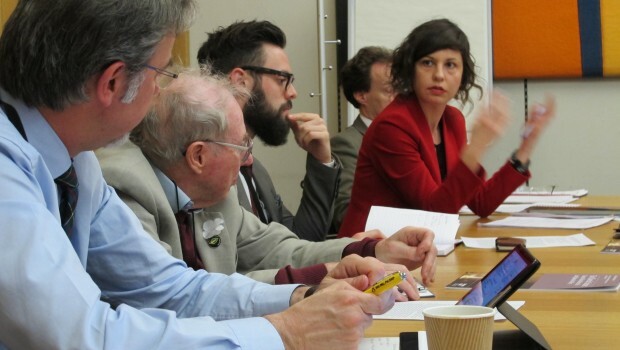 At Westminster on 24th May, the All Party Parliamentary Group (APPG) on Weapons and the Protection of Civilians held a roundtable briefing for parliamentarians on the latest developments at these important multilateral nuclear disarmament talks. Nia Griffith MP (Labour), Chair of the APPG, hosted the meeting. Dr Beyza Unal of Chatham House International Security Department (pictured above) opened by arguing that the burden of proof rests with those countries which possess nuclear weapons to show that their weapons do not pose an unacceptable risk to humanity. Chatham House research presented at the OEWG in May highlights the connections across the divides between nuclear disarmament and other important issue-areas: climate change and environment, sustainable development goals (SDGs) and international development, protection of cultural heritage, public health, gender, non-state armed groups, cyber security, and humanitarian action. The continuing risk posed by nuclear weapons use—deliberate, accidental, inadvertent—is rarely factored into policy-making, but this must change, Dr Unal argued. Thomas Nash of Article 36 (which facilitates the APPG on Weapons and the Protection of Civilians) explained that the UN Open Ended Working Group (OEWG) has its roots in the ‘Humanitarian Initiative’ on nuclear weapons. This initiative has succeeded in creating a fundamental shift in the international discourse on nuclear disarmament over the past six years, based on new evidence presented at three major government-level conferences on the humanitarian impacts of nuclear weapons. So far, 127 nations have endorsed the Humanitarian Pledge to ‘fill the legal gap’ for the prohibition and elimination of nuclear weapons, and it became clear at the OEWG that a majority of countries are ready to go forward towards negotiations on a new treaty. Mr Nash explained how ‘big-hitters’ such as Brazil and Malaysia are now joining other champion states to push for a new treaty process which will be open to all and blockable by none. In other words, nuclear armed states such as the UK will not be able to use their veto power to disrupt progress on disarmament, which they have consistently done in the past. This was the real breakthrough at the OEWG, according to Mr Nash – the acknowledgement that this process can and must be led by non-nuclear-weapon states. Rebecca Sharkey of the International Campaign to Abolish Nuclear Weapons (ICAN UK) explained that the UK government’s refusal to participate in new UN-mandated nuclear disarmament talks has led to statements of regret from around the world, as well as to questions about the credibility of the UK’s commitment to multilateral disarmament and obligations under the NPT. “There is a growing international consensus that the status quo is no longer acceptable, and mounting pressure on the UK government to alter its current unreasonable position on nuclear weapons” – Rebecca Sharkey, ICAN UK. There were strong challenges at the OEWG to the policy of ‘nuclear deterrence’ and a continued reliance on nuclear weapons for security by countries such as the UK. Thailand asked: “Who exactly does nuclear deterrence benefit? Does it mean security for all, or security just for some? How does nuclear deterrence lead us to a world free of nuclear weapons?”. Ireland argued that “nuclear weapons are too dangerous to be seen as a legitimate instrument for security”. The decision over the renewal of the UK’s Trident nuclear weapons will be voted on in Parliament later this year, at the same time that other states are engaged in multilateral disarmament talks that will rule those weapons illegal. This development must increase the political costs of holding onto nuclear weapons and sinking even more money in their maintenance and modernisation. Stephanie Marie Black León, Embassy of Mexico in the United Kingdom described her country’s strong commitment to a world free of nuclear weapons, enshrined in the Treaty of Tlatelolco which makes the whole of Latin America and the Caribbean a nuclear-weapon-free zone. Mexico is pleased with developments at the UN Open Ended Working Group (OEWG), which show how a clear majority of countries is now in support of a new legally binding instrument to prohibit nuclear weapons. Lessons from other disarmament processes, such as the Arms Trade Treaty, show that a disruptive minority is not able to prevent progress when the majority is determined to pursue disarmament. Discussion then addressed issues around how a ban treaty would fit with the NPT (Nuclear Non-Proliferation Treaty) and NATO. Thomas Nash explained that a ban treaty is intended to reinforce the NPT (especially Article 6 on negotiating ‘in good faith’ effective measures for nuclear disarmament), and that any threat to the NPT regime comes from states with nuclear weapons, not from a process to prohibit them. Interesting developments in Norway and The Netherlands – where there is now parliamentary support for a nuclear weapons ban – show that there is movement within NATO on this issue. Baroness Sue Miller (LibDem) expressed support for a new treaty to prohibit nuclear weapons, and said that arguments based on International Humanitarian Law are a helpful approach to the issue of nuclear disarmament, especially in the House of Lords where there are so many people with a legal background. Ronnie Cowan MP (SNP) highlighted the devastation and displacement of populations caused by nuclear weapon testing, and pointed out how the Government’s small majority means that the vote on Trident renewal due later this year can be defeated.